The picture above was acquired by NASA’s EPIC (Earth Polychromatic Imaging Camera) instrument on board the DSCOVR spacecraft, operated by NOAA. It’s one of twelve images captured during the course of the eclipse from DSCOVR’s position at L1, 1.6 million km (nearly 1 million miles) away. Read more: What Are Lagrange Points? 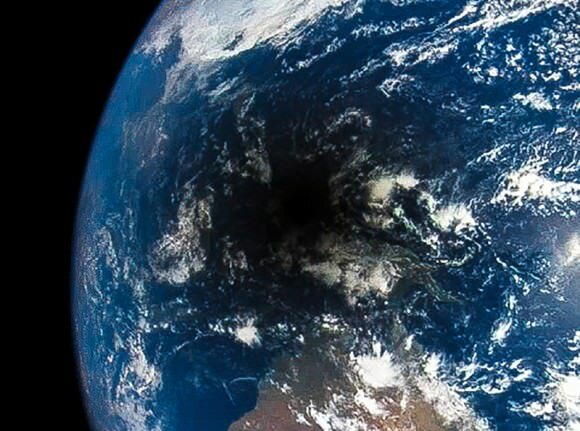 The Moon’s shadow during a total eclipse looks like a black hole on the Earth (no actual singularities were involved.) DSCOVR/EPIC image. Watch an animation of the Moon’s shadow traveling northeast across the Pacific here, and for more images of the March 2016 total eclipse (captured from the ground) check out this article by David Dickinson. The next solar eclipse in 2016 will be on September 1, and will be a partial/annular eclipse visible from Africa and the Indian Ocean. The next total solar eclipse will occur on Aug. 21, 2017, during which the path of totality will cross the United States from coast to coast. *DSCOVR is actually in a “halo orbit” around L1, which affects its viewing angle of Earth—this is why we see the Moon’s shadow and not the Moon itself (and when it does see the Moon in front of Earth there isn’t a shadow or eclipse.) Read more on Phil Plait’s Slate article here.